This property offers magnificent views that reach past beyond the sea of rice fields. It lies along the mountain slopes in central Bali, where the breeze flows. Located just an hour and a half by road from the major tourist centers of Kuta and Ubud, and on the rice field road that leads to Pupuan and the north coast. It’s an ideal location for retreat leaders seeking that their participants experience a connection with nature, making it an excellent option for Silent Meditation Retreats. Of which 4 of these rooms may be converted into twins bedding. All rooms have large verandahs, bathrooms with shower and hot water, facilities for making drinks, and spring beds. The Cottages are set in the large garden, amongst the trees and rice fields. 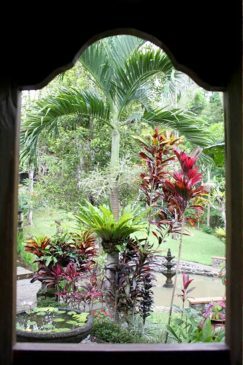 Pathways and steps will lead you through the property’s gardens filled with frangipani, heliconia, coconut palms, coffee, clove, cocoa, durian and mangosteen trees. The properties lap swimming pool is surrounded by green lush. The upstairs communal area, may be used for group talk sessions. The neighboring activities room, at the pool level, maybe be converted into a space for group sessions. Everywhere there are places to sit and chat or just relax and listen to the sound of running water. Your stay will be shared with the sound of the wind shuffling through the leaves on the trees. Breakfast, lunch and dinner are served in the restaurant. Catering for buffet meals for groups may be organized. Activities such as learning how to make Balinese Crafts or roast local coffee can be arrange for your retreats. Trekking through the valleys, rice fields and local villages is a wonderful way to see Bali at your own pace. The local staff can guide you through their own villages and show you the sights, and you can stop for a refreshing young coconut along the way. The adjacent gift shop allows any last minute shopping for gifts to be taken back home. A sandy and wildly beautiful beach is 15 minutes drive away down the hill. If you follow the road to the west along the coast you will enjoy endless pebble beaches and surf. Several Balinese Temples are within close range and a day excursion may be arranged. Exploring In & Around Tabanan. If you wish to Host your Retreat in Bali at this venue, rates start at $67 USD per person / per day in double occupancy during low season.